Are you still looking for the best keyboard case for your iPad Pro 10.5? Worry less; we got you covered. The best part about keyboard cases is that they are slim and very lightweight to carry them anywhere. The keyboard case prevents your iPad from nasty scratches and external damage. In this article, we will be discussing KuGi iPad Pro 10.5 Keyboard Case. KuGi 10.5 Keyboard Case can transform your iPad into a superior looking laptop. The keys are highly sensitive which enables you to type with the kind of flow you prefer. 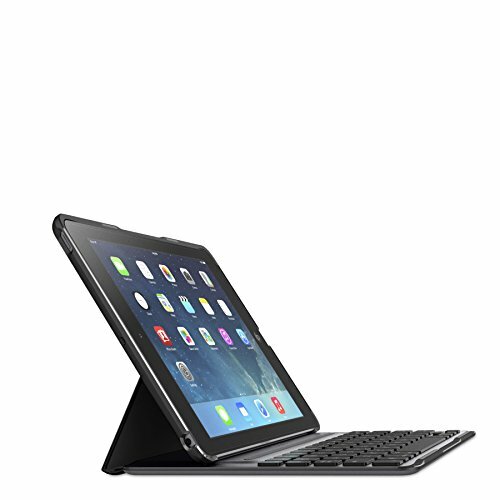 Additionally, this keyboard case features an ultra-thin lightweight design – makes it convenient to carry and also offers all-round protection to your iPad at the same time. The Bluetooth V3.0 keyboard is detachable. The KuGi iPad Pro 10.5 Keyboard Case features a remarkable battery life which lasts up to 90 hours and a standby time of around 30 days – this allows you to work for an extended period without worrying about the battery. Additionally, the battery takes around 2.5 hours to 4.5 hours to recharge the battery completely. The best part about this case is that it automatically moves to sleep after five minutes of inactivity to save the battery. It is very easy to set up the keyboard case with your iPad Pro. You just need to turn on the Bluetooth key, and it will show on your iPad Pro Bluetooth devices list. Just click on it, a prompt will show where you will enter the code on the iPad and that’s it. You can use the iPad as the traditional laptop, thanks to its magnetic stand holder. It features all the unique functions such as lock, sleep, slideshow, volume, home, and much more. Another impressive thing about the KuGi iPad Pro 10.5 Keyboard Case is that it comes included with free lifetime technical support and 12-months limited warranty against the manufacturer’s defects. The keyboard case measures 11.3 x 8.1 x 1.3-inches and weighs only 1.1 pounds. The keyboard case is durable. It has an astonishing battery life which can last up to 90 hours of continuous use. It is lightweight and convenient to carry. It has a removable pencil holder. The Bluetooth could not stay connected. The binder is a bit weak and doesn’t hold quite well when closed. The KuGi iPad Pro 10.5 Keyboard Case is an excellent choice for those looking for an inexpensive keyboard case for their iPad Pro 10.5. This keyboard case delivers astonishing features at a low price. It has an extended battery life of up to 90 hours and is Bluetooth compatible. This keyboard case is worth every penny.